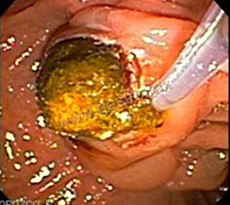 Endoscopic retrograde cholangiopancreatography (ERCP) is a procedure used to identify stones, tumors, or narrowing of the bile ducts. The procedure is done through an endoscope. An IV will be placed in your arm. You will lie on your stomach or on your left side for the exam. You will be given medicines to relax or sedate you through an intravenous line. Sometimes, an aerosol is also used to numb the throat. A mouth guard will be placed to protect the teeth. Dental prostheses should be removed. After the sedative takes effect, the endoscope will be inserted through the mouth and passed through the esophagus and stomach until it reaches the duodenum (part of the small intestine that is closest to the stomach). You probably will not feel any discomfort and may not have memories of the exam. There may be some nausea while the catheter is going down the esophagus. As the endoscope takes place in the right area, there will be some dilation of the stomach and duodenum. You may feel the dilatation of the ducts. A thin tube (catheter) will be passed through the endoscope and inserted into the tubes (ducts) to the pancreas and gallbladder. A special dye will be injected into these ducts and x-rays will be taken. This helps your doctor see stones, tumors, and any areas that have narrowed. Special instruments may also be placed through the endoscope into the ducts.